Ernest Shackleton, considered by many the greatest of all British polar explorers, thought himself a failure. 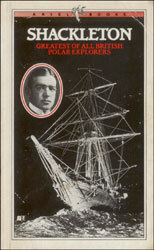 Of his three expeditions to the Antarctic, the first (under Scott's leadership) saw him invalided home; on the second he failed by less than 100 miles to reach the South Pole; and on the third his ship Endurance was crushed in the ice before he could even set out in his projected first crossing of the Antarctic continent. But the legend of his greatness remains. It was never doubted by the men he led, and is as firmly held today as it ever was. Christopher Ralling here throws light on the character and actions of this remarkable man through a chronological selection from Shackleton's own writings, public and private. Much of the material comes from Shackleton's own books, The Heart of the Antarctic and South, which recount the triumphs and disasters of the Nimrod and Endurance expeditions with the freshness and immediacy of the diaries on which they were largely based. Together with his poetry and letters - especially those to his wife Emily - they provide a lively self-portrait of a many-sided complex and fascinating man.